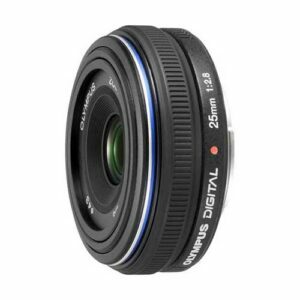 Lens Description: The world’s smallest DSLR deserves a similarly compact lens, and Olympus has it: the ultra compact Zuiko 25mm f2.8 digital specific lens. This 0.9 inch-thick lens offers a fixed 50mm equivalent angle of view. Together with the E-420, the Zuiko 25mm f2.8 lens will offer the ultimate combination of ease of use and portability.